I am writing to complain about your service. This letter is follow up to my phone conversation yesterday with your customer service. On the 22.11.2012 I had a phone call from EE (Orange) to join your new EE broadband and home phone plan, at £15.00 a month plus £14.00 line rental, which includes international landline calls to 30 countries, and anytime calls to any UK mobile network (1,000 minutes a month). Also was agreed that EE (Orange) will sort it out with my current BT provider that all line rental and bills will be stopped from that date. You could listen at your recorded phone calls, and see that we agreed to go ahead. I did receive a few minutes later an email sent to myself [email protected] as confirmation to the new contract (see attached). In the paragraph What happens next: Your plan will be changed in the next couple of hours. Following this email I relied on the new plan and started to make international land line & UK mobile calls. 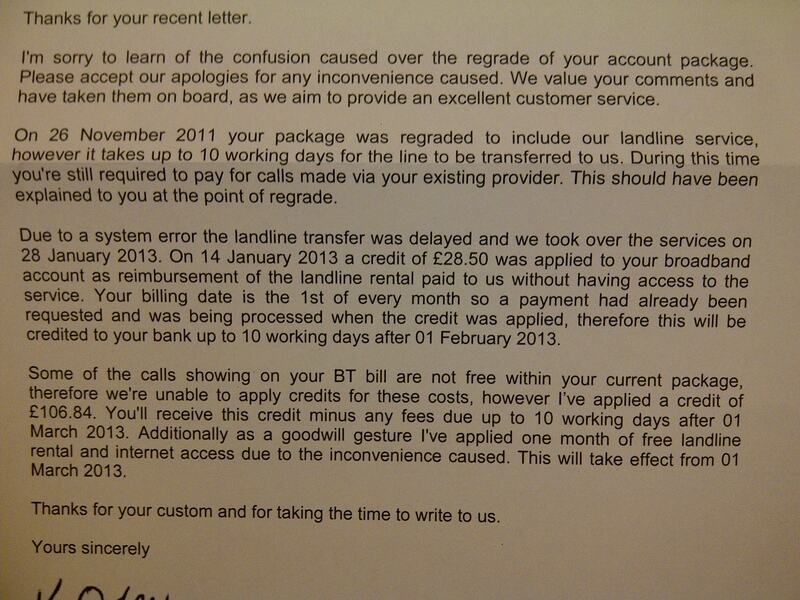 From my account I have been charged for this new plan on the 14.12.2012 £36.21. WHY? I called EE (Orange) straight away, the person first apologized and said yes we know there is an error and I should send in the bill for EE to settle it. On the phone yesterday was also agreed the following, for the current situation I will not be charged until further notice. Today 15.01.2013 I have been charged again £28.50. WHY? Waiting to your response ASAP! I’m writing regarding my complain to EE (orange) see letter, contracts and bill attached. I have sent this letter by royal mail. Unfortunately somehow it got lost in the post. You should send a recorded delivery letter and say that you want payment within £380 unless payment is received within 14 days or you will go to Court. If they refuse or do not reply then you can issue proceedings. You can do this online at: www.moneyclaim.gov.uk - you will have to pay a fee but this will be added to the claim. As the claim is below £5000 you wont need a Solicitor as this will be a small claim. But you can't claim compensation as you have not suffered a loss (as of yet). But you will be surprised how quick matters are resolved once proceedings are issued. They have given me a non correct delievery address Po Box which never been received, therefore i have sent them a copy by email but they never confirmed they received the email. they told me on phone last week, sorry we cannot confirm that we received your email.how do i take this further? By sending letters recorded delivery. EE are based in Bristol and you can look up their address. I just received letter from ee. Please see attached. If you are not happy you can still ask for the money claim as I have advised. that's wrong please see confirmation email on "22.nov 12"
In the paragraph What happens next: Your plan will be changed in the next "couple of hours". They don't mention £36.21 which was debited from orange home on 14/12/12. How do they get to this amount? As by today i have finally received the final bill from BT up to the 14 jan 13 which includes the previous bill amount BT is £370.84. they have deducted the rental line. This is why I ask you to review the earlier posts. You can issue proceedings in the small claims court. How do i calculate the amount i'm claiming? Include the highest amount owed. Do i have to write to orange that i made a claim in court? Yes you should give them warning first. I filled a claim online already this afternoon.what should write to them now? Does that mean the claim is void?